It's very easy to detect if your dog has an ear problem because they will shake their head and paw at the ear. Ear infections usually produce a very strong and unpleasant odour and should always be investigated by your vet. If your dog has a lump of any kind on their ear, I would recommend taking them to your vet for diagnosis. It will more than likely be an ear haematoma, i.e. a little pocket of blood that forms in the ear and is usually treated with very simple surgery. 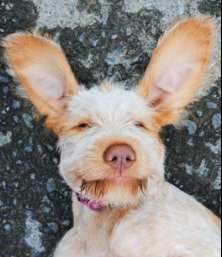 If your dog is shaking its head and worrying at its ears, but they appear clean, take them to your vet immediately for further investigation as they could well have a foreign body stuck in their ear. This could be a twig, a grass seed or a cleavers seed (sticky willy) which could in time perforate the dog's eardrum and cause major damage, so prompt action is advised. Pseudomonas is a gram negative bacteria that is highly resistant to most strains of antibiotics and takes aggressive and prolonged treatment to clear. As Spinoni seem to be very susceptible to this particular infection, always ask your vet to perform a swab test before treating ear infections as the type of treatment will vary between pseudomonas and other bacteria. The ear will need to be cleaned thoroughly before administering drops. Ear infections are often accompanied by ear mites so be sure to treat for them too. If your dog has pseudomonas, use Quistel to keep them clean throughout treatment, although some have claimed success using one part cider vinegar to one part boiled, cooled water. If Quistel isn't available in your part of the world, try this recipe: Home made ear cleaner. It is very important to keep the ear dry as the bacteria thrives in warm, moist conditions, so be sure to wipe the ear thoroughly with clean dry cotton wool after cleaning. Ear infections can sometimes be caused by food allergy. If your dog has an ear infection which does not clear or keeps coming back, it may be worth changing their diet. Carbohydrates such as wheat or corn are common culprits but also meats such as chicken and lamb can also have an effect. The best first step is to try a simple exclusion diet by choosing a food with rare ingredients that you haven't routinely fed before, e.g. duck or fish with a potato or sweet potato carb' content for kibble feeders, and duck or green tripe for raw feeders. Try your dog on this for 6 weeks to see if there is an improvement, making sure that you avoid any treats other than the limited foodstuffs you have chosen. These 'rare' foods are often expensive to buy and as such may not be ideal for the long term but can be very useful in highlighting whether or not an allergy is the cause. By re-introducing foods one at a time, you can isolate the culprit food and avoid it in future, hopefully without any great cost! It is worth pointing out that gram negative bacterial infections such as pseudomonas can be very persistent without any underlying food allergy, so don't panic if a change of diet does not help. Ear mites will cause intense irritation to your dog and result in head shaking and pawing. They are characterised by a dark residue that looks coffee grounds and a reddening of the skin. There are several commercial treatments available for ear mites. Thornits can be used on the outer part of the ear by rubbing a pinch gently into the skin but be wary of any powder going directly into the ear canal where it can cause a blockage. Otodex do drops which can be used in the canal itself to treat infestation, or your vet may prescribe some other treatment. Mites and infection often go hand in hand, so if there is no improvement after treating for 4 or 5 days, go to your vet and ask to have the ear swab tested for infection. Check your dog's ears at least once a week. If there are grass seeds or cleavers (sticky willy) where you exercise them, then quickly check after their walk and remove any foreign bodies that have attached themselves. If they are relatively clean then there is no need to do more than wipe them gently with a ball of cotton wool and some boiled, cooled water. If there is a build of wax then use Quistel ear cleaning solution or Home made ear cleaner. You can warm the ear cleaner by placing it in a mug of hot water for a few minutes before using, this will make it less unpleasant for your dog. Also, instead of squirting directly into the ear canal, try saturating a cotton wool ball, place it in the ear and close the ear flap over it and give it a good squish. If you choose to strip the hair inside your dog's ears, rub some Thornits powder into the skin beforehand as it makes it much easier and less painful to strip the hair out. If Thornits is not available where you live, try this recipe: Home made ear plucking powder. Any foul smell or heavy wax build up should be investigated by the vet.